I should begin by saying that I know absolutely nothing about guns. Or explosives. Or knives. Or armored powersuits. 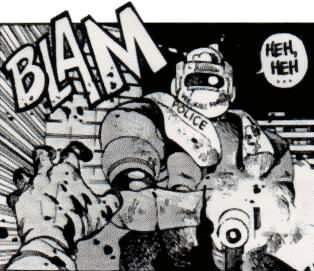 And Masamune Shirow does. Technology, particularly weapons technology plays a big part in Appleseed. On this page, you'll find an introductory-level list of gear for an Appleseed game. I've included links to some sites with more extensive lists as well as gun lists contributed by folks to The Matrix D6 RPG. I will gladly post submissions and corrections if you send them in. In the end, if there's something missing from this page, or it's just downright wrong, then do what all good GM's do: make it up! Damage: This is the standard damage that the weapon can do. Simply roll the number of dice indicated and add any other modifiers. Note: the damage system does not follow WEG's D6L standard system, which is success-based. Here, roll the dice and sum their value normally to establish the damage done.. Range: The range in meters of a weapon. Difficulties increase with greater distance (see Actions and Combat). Scale: Indicates the scale of the weapon when deciding damage. Difficulty: The difficulty number the user must equal or surpass in order to hit. Concealability: A measure of how difficult it is to conceal the weapon under clothes. GM's may modify this depending on the kind of clothes worn (increased difficulty if only an evening gown is worn, bonuses is an overcoat is worn). Complexity: Some weaponry is particularly complicated to repair. Add any complexity modifier to the base difficulty when such attempts are made. Note: A typical knife can be thrown, but increase the difficulty by 5. Knives are readily available in most of the world, though some states, including Olympus, have controls on openly carrying combat knives in public. Concealability: Moderate (length tends to by 1-2 feet. Note: Knives are readily available in most of the world, though some states, including Olympus, have controls on openly carrying combat knives in public. Note: Most developed states have laws against carrying around swords in public. However, swords are often used in the Badlands where ammunition for more advanced weaponry are scarce. Notes: Clubs are any blunt object made to hit something else hard. GM's should alter the damage rating depending on the quality of the club. For example, a broom stick might only do STR + 2 damage while a crowbar might do STR +2D. Also note that if the object is not very strong, it will likely break when used as a weapon. As I said before, the guns listed here are very basic. See the Ammunition list below for specialized ammo. For much more detailed lists of firearms, check out Joe's Gun Catalog or Aaron LaBow's weapons list in PDF or Word 2000 formats. You can use the ranges given below for the weapons that Joe lists (or the ranges listed by Aaron). Ammo: 6 (revolver) to 12 (automatic). ROF: Single: 3 shots per round. Semi-automatic: 2 bursts of 3 bullets rendering 6D damage per burst (roll once per burst). -1D on "To-Hit" rolls in semi-automatic. Full automatic: Can empty the clip in one round, either spraying (See Spraying in the Combat section) or Concentrating Fire resulting in +1D to hit and 7D damage. ROF: Single: 3 shots per round. Semi-automatic: 2 bursts of 3 bullets rendering 8D damage per burst (roll once per burst). -1D on "To-Hit" rolls in semi-automatic. Full automatic: Can empty the clip in one round, either spraying (See Spraying in the Combat section) or Concentrating Fire resulting in +1D to hit and 9D damage. Concealability: Difficult for full-barrelled shotguns. Moderate for sawed-off shotguns. Notes: Sawed-off shotguns with buckshot do 7D damage at Point Blank range but suffer a -1D cumulative penalty to damage rolls for every 5 meters beyond the first. Concealability: Easy (about the size of a normal submachine gun). ROF: Maximum of three shots per found. Notes: A cyborg pistol is any gun that is too large for a normal human to lift without some kind of technological aid. Notes: This is just a higher-caliber version of the "standard" cyborg pistol. Modifier: The less expensive models have a problem with remaining stable and make it harder for the gunner to hit her target. Depending on the quality of the weapon, the user will suffer anywhere from -2D to 0D to Firearms skills. ROF: Single: 3 shots per round. Semi-automatic: 2 bursts of 3 bullets rendering 8D damage per burst (roll once per burst). -1D on "To-Hit" rolls in semi-automatic. Full automatic: Can empty the clip in one round, either spraying (See Spraying in the Combat section) or Concentrating Fire resulting in +1D to hit and 10D damage. Notes: This is the standard issue rifle used by most full-body cyborgs and landmate pilots. The gun can be fit with a variety of options, including being fit for a weapons link opic, flash dampener, targeting scope, etc. and can use a wide range of ammunition. ROF: Single: 3 shots per round. Semi-automatic: 2 bursts of 3 bullets rendering 10D damage per burst (roll once per burst). -1D on "To-Hit" rolls in semi-automatic. Full automatic: Can empty the clip in one round, either spraying (See Spraying in the Combat section) or Concentrating Fire resulting in +1D to hit and 11D damage. Notes: This is a more advanced rifle used, usually used by special operatives and hard-hitting mercenaries. It carries less ammunition, which can be a problem in prolonged firefights (Landmates rarely carry more than 1 or 2 spare clips). The gun can be fit with a variety of options, including being fit for a weapons link opic, flash dampener, targeting scope, etc. and can use a wide range of ammunition. Below is a quick list of special ammunition that will alter the effects of various firearms. It is neither complete nor very realistic. But, I think it'll work. Standard Rounds: Do the damage listed under each weapon. These are the cheapest and most commonly used. Armor Piercing (AP): AP rounds reduce the target's armor by 1/2 for purposes of breaking through it (though the Armor still retains its original value). This means that more damage is done to the structure of the target (usually the person's hit points). However, AP rounds reduce a weapon's Damage rating by 1D. HESH (High-Explosive Squash-Head): HESH rounds are designed to mess up armor as much as possible but do not pass damage on to the armor's wearer. HESH rounds do the -2D damage and all damage is taken by the armor. Thus, a Heavy Pistol will do 3D damage to the target's armor. Furthermore, the target must make an opposing Strength roll against the damage roll or be knock to its feet (if it has feet). Note that if HESH rounds are used on an unarmored target, they do damage as normal rounds. Baton Rounds: Baton rounds can be loaded in specially modified weapons to deliver a stunning round. The target must make a Resistance roll versus 6D stunning damage (10 seconds/2 rounds of stun for each EV point). The target must also make an opposed Strength roll against 6D to avoid being knocked off her feet. Cost: 20-500 credits, depending on style..
Concealability: Very Easy (but usually unnecessary). Availability: Common in developed nations, though some place controls on civilian purchases of armor. Game Notes: Reduces Dexterity-based rolls by 1 die. Game Notes: Wearer suffers -2D modifier to all Dexterity based rolls and -1D to all Instincts rolls based on Perception. Availability: Rare. Usually only available to special forces personel. Power: 8 hours of continual use. Can be powered off (acts as Personal Body Armor). Recharges in 5 minutes with low-powered battery or standard power outlet. Game Notes: Gasium armor is a lightly-powered personal armor that actually slightly increases a wearer's Strength, Dexterity and Constitution. The advantage from the armor grants the wearer a Boost each time he attempts a skill controlled by one those attributes. Cost: approximately $15,000 for standard suit. Options may be added for an additional cost. Notes: These suits are a step below the standard landmate. They are worn more like a suit of armor than they are piloted. They come in a variety of shapes and sizes, with many different options available (see Conversions, below). Most owners use them as "sport" models. Some can be outfitted for use as scout or recon units (such as Hitomi's suit in Appleseed Volume 1: Book 1). All such powersuits must also be registered with the Olympus authorities. 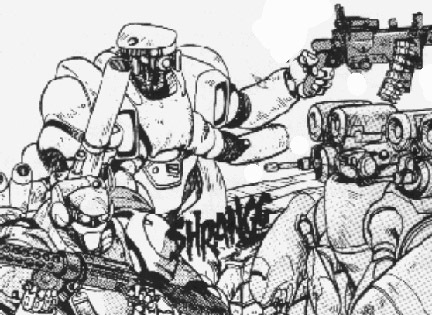 Author's Note: I know that Shirow has a certain name for these kind of powersuits/landmates--I think I read it in the Databook (which I don't have with me right now). If someone knows the real name, email me). Strength: 5D with a Boost. Vocal: Can be equipped with a loud speaker and translators as necessary. Cost: Not available to the general public. $75,000-$100,000 on the black market. Notes: ORCS are used by special forces teams when they need to be more stealthy or maneuverability than landmates permit. They are powerful units in their own right and are highly customizable to whatever a particular mission might require. Computer technology in most of the developed world has far exceeded the limits of early 21st centuary machines. Olympus, by far, boasts the most advanced computers, almost all of which have some degree of artificial intelligence. It has also seemless integrated computer processing ability with human/bioroid brains. The interface systems of most common computers render it so that even the beginning user can easily access the system. Goggles: Each pair of goggles may have up to 4 options listed under Cybernetic: Optics. Sniffer: This device is used to sense if there are biological or chemical agents in a medium, such as air, water, food or soil. The device is Very Easy to use and will detect dangerous, known chemicals and biological agents automatically. It is about the size of a pocket calculator. Landmates are operator-piloted armored suits designed to provide the pilot with superior protection, freedom of movement and firepower. In Olympus, landmates are made available to the general public and widely used by law enforcement and the military. Public landmates must be registered and cannot be equipped with heavy armor or weapons. Landmates are still pretty expensive, but the low end domestic models are fairly affordable (It's a little like buying a suped up sport motorcyle, according to Shirow). Repairs on landmates are still relatively expensive, and those citizens that keep them for private use usually know how to fix their own units. Each part in a landmate is handmade but may be swapped between similar models. To use a landmate, the operator must step up into the "cockpit" and fit her arms into the slave arms in the torso (this is why most landmates appear to have 4 arms). The pilots legs fit into the thighs of the unit and the pilot's head is usually about in the middle of the torso. The cockpit is the most heavily armored part of the unit (of course!). Most pilots wear a thin suit of datafilm, but it is possible to wear a full suit of Gasium armor in the more advanced combat models. Below is a very preliminary list of Landmates. I have not included any built-in weapons, though many landmates do carry integrated weaponry. It appears that the more professional landmate designs opt against this, probably to so that the units remain more easily customizable for each mission. I will be adding much more soon, but this should be enough to get you started. Please remember that these need to be playtested. So, tweak as needed! Strength: Represents the wearer's Strength while in the Landmate. Jumping Bonus: to be added to all Jump attemps while the LM is worn. Dexterity: This is the Operator's effective Dexterity while in the LM. Some high-quality LM's will augment the pilot's abilities. If this value is higher than the pilot's normal skill levels, those skills are increased to equal this value. Armor Value: Protective points, as normal armor. Hit Points: Structural integrity of the suit. When a LM is reduced to 1/4 points or less, each time it takes damage 1 die worth of those points (1D6) pass to the wearer. Furthermore, the suit will suffer penalties just as a wounded person would. So at 3/4 points, it reduces all the pilot's rolls by 1D. At 1/2 and less, they are reduced 2D, etc. When the HP's reach 0, the suit will cease to function and the pilot must roll a 1D6. On a one, the suit will explode in 5d6 seconds causing 5D6x3 points of damage to anyone within 2 meters of it. Complexity: This is added to the base difficulty to repair the LM. Optics: A list of optical options available to the pilot. See Cybernetics for a more complete description. Communications: A list of communications gear loaded into the unit. See Cybernetics for more information. Vocal: An vocal hardware and software built into the machine. Notes: Additional information about the suit. Dexterity: Operator's Pilot LM skill. Notes: These suits come in a variety of shapes and sizes and are now widely available to the public. Most can be easily modified by a knowledgeable mechanic. Vocal: Built-in Loudspeaker (masks the Pilot's voice). Notes: No suit is truly "generic" but this will serve as the standard for run-of-the-mill landmates. Most professional groups, such as SWAT, ESWAT and the FBI will use more advanced suits such as the GUGES. Notes: This is the standard, civilian model that Deunan purchases early in Book 1. Once she joins ESWAT, it appears that she upgrades to more advanced models provided by the government. Options: There is a police light set atop the head (presumably to make them easier to shoot at...). Likely they can emit some kind of siren wail as well. Notes: This is the standard model worn by the rank-and-file beat cops in Olympus (those on the landmate team, anyway). They are powerful suits, but are not as advanced as the GUGES-D worn by ESWAT and other special forces. Options: The GUGES-D may be fit with a Flight Rig, shown in the color image to the right. This uses anti-gravity technology to provide the unit with lift and silent thrusters for propulsion. It is not intended for long flights, but can remain airborne for about 2 hours. It may travel at about 200 mph, or 250 top speed (reduce flight sustainability by one half). The Rig provides enough power to lift an additional landmate if need be (but not much more! ).